Today at the Southwest Dental Conference I am presenting a half day program on appliance therapy. One of the common questions we manage when making appliances is “what type of appliance should I make?”. I don’t have a belief that any one appliance is superior to others. I do believe that each design of appliance works for a specific set of clinical indications and has a certain set of contra-indications or risks. Which design I use is individualized to the patient based on their exam findings and my clinical suspicion. 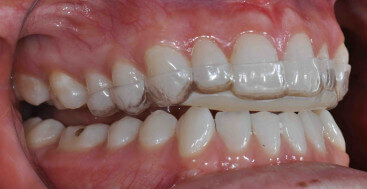 The anterior bite plane appliance is a design I use commonly in my practice. The principle behind this appliance is that when back teeth are separated the elevator muscles don’t fire with the same force, thereby reducing the load across the system and allowing the muscles to release. The lack of posterior tooth contact also releases the Lateral Pterygoid allowing a seated condylar position to be recorded as part of the treatment planning process. This appliance design goes by many names, but the basic design is the same and the physical principles are consistent. This appliance design can easily be fabricated in the office while the patient is there. Additionally, without posterior contacts as the muscles release and the condyles seat no posterior interferences are picked up that require monitoring and adjustment, so the process is efficient. 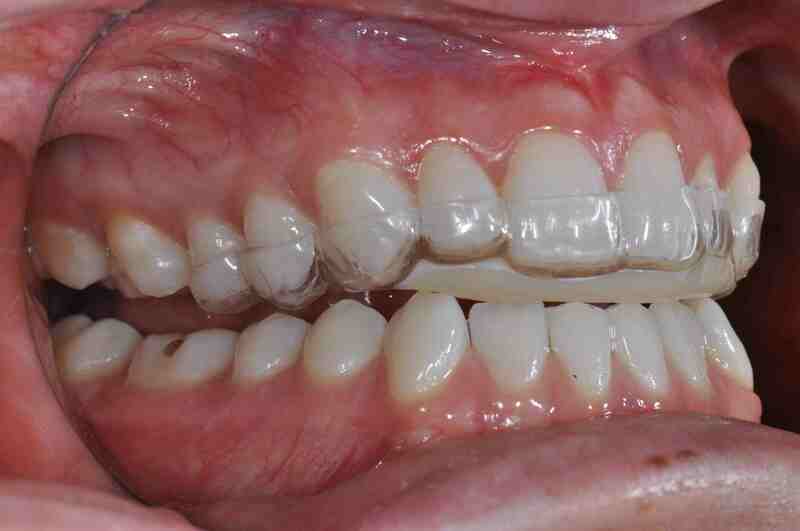 This is similar to the “Roth Splint” in orthodontics. I like the way you made this with the overlay for esthetics and then the acrylic bite plane added. This is much more esthetic than the Roth Splint. Could you do a video of this fabrication? Could you do a video of the fabrication of the mouthguard? We made our first one but we had a hard time doing the clear layer added to the colored layer. Still trying to figure that out! Thank you for all of your accomplishments. They are wonderful! I’ll post the fabrication video as Monday’s post! Lee Ann, I would point out that in your splint design, the canines can occlude and thus the anterior belly of the temporalis muscle can fire and contract and elevate the mandible. I personally use an AMPSA (anterior mid point stop appliance) e.g Hornbrook, Nosti, Kois, Ritsco…) to erase muscle memory ad allow condylar seating and thus CR recording. Just my 0.02 cents! There are various designs for this type of appliance. You are absolutely correct. This type of appliance can be made with centrals only or to include the canines. Canines will increase muscle activity over simply having centrals. I find that for most of my patients this still works as a very efficient and effective appliance. I utilize multiple anterior teeth to balance the two reasons we alter occlusions, reducing muscle engagement and distributing forces. I do however have patients that need the canine contacts removed to get the intended benefit, although this is a very small number. Either way I think it is a great appliance design for the stated reasons. Thanks for adding this to the discussion. I have been placing anterior bite plane for Nightguard appliance. I have noticing some anterior open bite due to posterior super eruption. How do you prevent and manage anterior open bite issues? I do a large number of these appliances, and this is a very rare problem when managed properly. These appliances are for night time use only, and if worn during the day you need to expect that you may see this more often. Even with just night time wear these patients need to be monitored over time. I give all of my patients the same instructions. “when you first wake up and take the appliance out, touch your teeth together. If the appliance is working you won’t feel your bite, but your teeth will touch someplace else. Then in fifteen minutes touch your teeth together and you should feel the bite you are used to. If it ever starts to take more then 15 minutes to find the bite you are used to, you need to call and come in.” There are two possible causes of bite changes. The most common is condylar seating due to deprogramming. The appliance is designed to do this, and sometimes it works so well the patient loses MIP. This never happens overnight, it is gradual, much more common when the appliance is worn during the day. The other cause is tooth movement, much less common. Could be posterior extrusion, or anterior intrusion. I check every patient for the amount of muscle activity reduction. If this appliance does not significantly drop elevator muscle activity and you put all that force on 2 lower incisors that is a higher risk then when it drops elevator muscle activity dramatically. The good news is it reduces muscle activity dramatically in most people. If you have a patient with an anterior open bite. Take upper and lower alginates, pour models and try to hand articulate them. If you can still reproduce MIP on the hand articulated models, the patient experienced deprogramming and lost MIP. If you can not find MIP on the hand articulated models then tooth movement occurred.